The “Spotlight on Controls” series focuses on a single WinForms control in PowerShell Studio 2012, details the important Properties, Methods, and Events of the control and demonstrates how to utilize the control. Most of the information about the controls is still applicable to previous versions of PrimalForms. Why use a StatusStrip control? 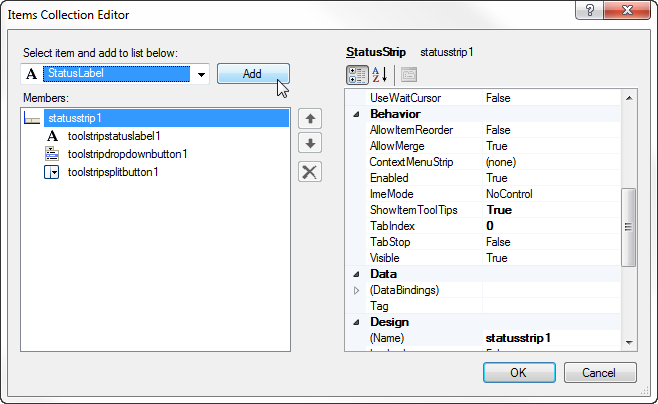 Use the StatusStrip control, to display status information to the user. The StatusStrip serves as a replacement to the StatusBar and also offers more support for user interaction than the StatusBar by allowing you to add buttons, progress bars, and other controls. This property allows the items in the StatusStrip to be reordered when the ALT key is pressed. This property indicates whether a sizing handle (grip) is displayed in the lower-right corner of the control. This property is mainly cosmetic and should be set to False when using fixed sized forms, such as when the form’s FormBorderStyle property is set to FixedDialog. For more details about the Form control and the FormBorderStyle property, please refer to the Spotlight on the Form Control article. 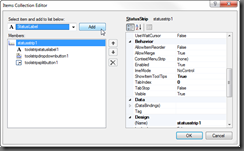 This property indicates whether ToolTips are shown for the StatusStrip. 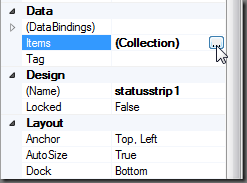 Set this property to True when you want to provide help information for items in the StatusStrip. This property indicates how the StatusStrip lays out the items collection. Specifies that items are laid out automatically. Specifies that items are laid out horizontally and overflow as necessary. Specifies that items are laid out vertically, are centered within the control, and overflow as necessary. Specifies that items flow horizontally or vertically as necessary. Specifies that items are laid out flush left. 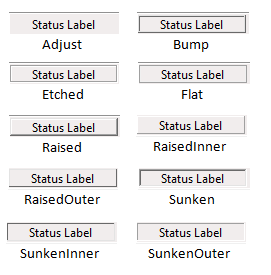 Otherwise the items that do not fit in the StatusStrip (depending on form size) will be hidden from view. 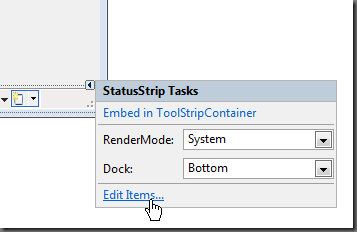 This property indicates which StatusStrip borders are docked to its parent control and determines how a StatusStrip is resized with its parent. The control is not docked. The StatusStrip becomes a free floating control that cannot be moved by the user. The control’s top edge is docked to the top of its containing control. The control’s bottom edge is docked to the bottom of its containing control. The control’s left edge is docked to the left edge of its containing control. The control’s right edge is docked to the right edge of its containing control. All the control’s edges are docked to the all edges of its containing control and sized appropriately. This property contains all the items that belong to the StatusStrip. This property consists of a collection of ToolStripItems, which come in various flavors. For more information, refer to the ToolStripItem Types section below. Note: To edit the item’s properties you will have to select the ToolStripItem and use the Property Panel. You can also use the Item Collection Editor to add items to the StatusStrip. Adds a ToolStripItem that displays the specified image to the collection. Adds a ToolStripItem that displays the specified image and text to the collection. Adds a ToolStripItem that displays the specified image and text to the collection and that raises the Click event. This event occurs when a ToolStripItem is clicked. This event allows you to handle all the click events in one location, but it is not recommend using this event if you are have DropDownButtons or SplitButtons. Instead you should use each ToolStripItem’s individual event handlers. Write-Host "You clicked the label"
You can add a variety of items to the StatusStrip, which are presented below. Specifies the text to show on the Tooltip. If this property is not set and the AutoToolTip property is set to True, the item will use the Text property as its ToolTip. DisplayStyle Specifies whether text and images are displayed on an item. Specifies that neither image nor text is to be rendered for this item. Specifies that only text is to be rendered for this item. Specifies that only an image is to be rendered for this item. Specifies that both an image and text are to be rendered for this item. Image The image that will be displayed on the item. ImageScaling Indicates whether the image on the item will automatically resize to fit in the StatusStrip. Specifies that the size of the image on an item is not automatically adjusted to fit on a StatusStrip. The image retains its original size. Specifies that the size of the image on an item is automatically adjusted to fit on a StatusStrip. Text The text that is to be displayed on the item. TextImageRelation The position of the item’s text and image relative to each other. Specifies that the image and text share the same space on a control. Specifies that the image is displayed horizontally before the text of a control. Specifies that the text is displayed horizontally before the image of a control. Specifies that the image is displayed vertically above the text of a control. Specifies that the text is displayed vertically above the image of a control. DoubleClickEnabled Indicated whether the item can be activated by double-clicking the mouse. Click Occurs when the item is clicked. DoubleClick Occurs when the item is clicked. Note: Order for this event to be triggered, some types require that the DoubleClickEnabled property to be set to True. Represents a panel in a StatusStrip control. Use the StatusLabel to show text and/or an image. BorderSides Indicates which sides of the ToolStripStatusLabel show borders. 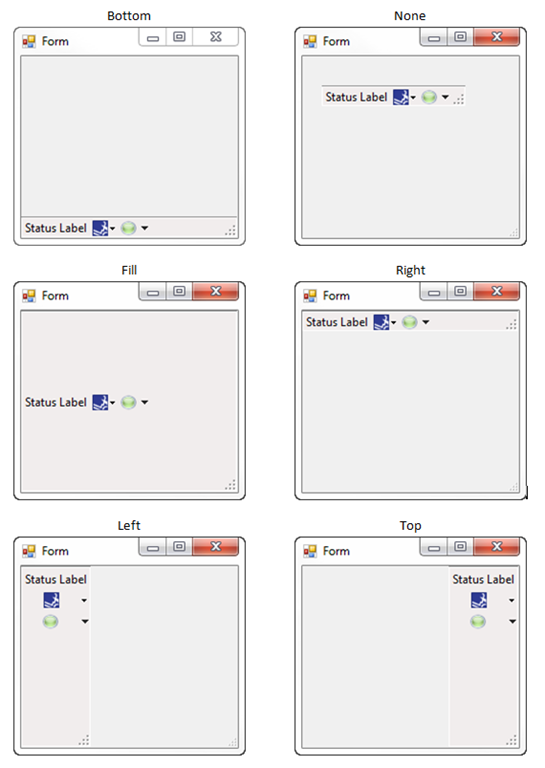 BorderStyles Indicates the border style of the ToolStripStatusLabel. The border is drawn outside the specified rectangle, preserving the dimensions of the rectangle for drawing. The inner and outer edges of the border have a raised appearance. The inner and outer edges of the border have an etched appearance. The border has no three-dimensional effects. The border has raised inner and outer edges. The border has a raised inner edge and no outer edge. The border has a raised outer edge and no inner edge. The border has sunken inner and outer edges. The border has a sunken inner edge and no outer edge. The border has a sunken outer edge and no inner edge. 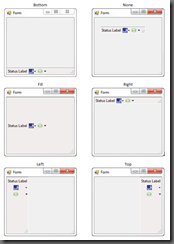 Spring Indicates whether the ToolStripStatusLabel automatically fills the available space on the StatusStrip as the form is resized. IsLink Indicated whether the ToolStripLabel is a hyperlink. LinkBehavior Indicates the behavior of a link. The behavior of this setting depends on the options set using the Internet Options dialog box in Control Panel or Internet Explorer. The link always displays with underlined text. The link displays underlined text only when the mouse is hovered over the link text. The link text is never underlined. The link can still be distinguished from other text by use of the LinkColor property. Represents a Windows progress bar control contained in a StatusStrip. Use the Progress bar to show the total progress of an operation. Maximum The upper bound of the range that is defined for this ToolStripProgressBar. Minimum The lower bound of the range that is defined for this ToolStripProgressBar. Step The amount by which to increment the current value of the ToolStripProgressBar when the PerformStep method is called. Value Indicates the current value of the ToolStripProgressBar. Please refer to the Spotlight on the ProgressBar Control blog article for more details on the progress bar. Represents a button that when clicked displays an associated menu from which the user can select a single item. 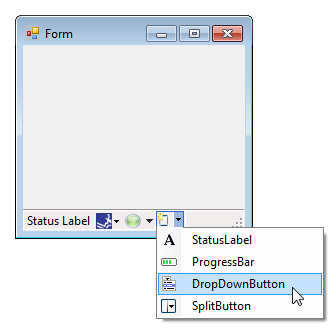 DropDown Specifies a ToolStripDropDown (such as a ContextMenuStrip) that will be displayed when this item is clicked. DropDownItems Specifies a ToolStripItem to display when this item is clicked. 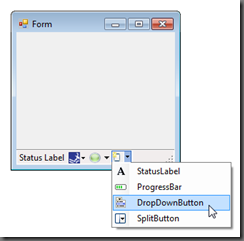 ShowDropDownArrow Specifies whether an arrow is displayed on the item, which indicates that further options are available in a drop-down list. DropDownItemClicked Occurs when the ToolStripDropDown is clicked. Please refer to the Spotlight on the ContextMenuStrip Control blog article for more details on the menus. 1. Set the ShowDropDownArrow property to False. 2. Clear any DropDown Items from the button. 3. Create an event handler for the DropDownButton’s Click event. Click Occurs when the button is clicked. Good stuff David! I love these “Spotlight on Controls” posts. Keep them coming!